The app, created by Weber Shandwick, can be added to a browser bookmarks bar by simply dragging it off the Web page to the bookmarks folder. Once installed, users can click it at any time to “Wholesomize” the content on their screens — meaning replace images and headlines with content “celebrating love, heartwarming family connections and acceptance,” in the brand’s description. The campaign is also starting its third year with four new 30-second ads from lead creative agency Droga5, one of which will be aired on television. 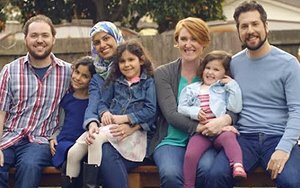 The new ads again portray diverse families, but also stress how acceptance can foster love and friendship within families and among neighbors. “In 2016, we're encouraging Americans to view the world through the eyes of acceptance — and remember that no matter how families might change, just like our products, what makes them wholesome remains the same," stated Katrina Plummer, equity brand manager for the Mondelez International brand. One spot (below) shows a family coming to bond with a Muslim family that moves in next door. The others feature a boy talking about his adopted brother (“Little Brother”); an Hispanic father talking about his gay son and son-in-law (“Mis Hijos”); and a wife talking about her disabled veteran husband (“Husband”). The campaign also includes social media, digital advertising, and public relations.